I had been looking forward to this gothic horror / romance for a while and it was one of my most anticipated movies of the year. Director Guillermo Del Toro had become one of my go-to directors in recent years, especially for his two Hellboy movies and the seminal masterpiece that is Pan’s Labyrinth. So anything with him at the helm seemed guaranteed for success. However my expectations were set a little lower after the stunning looking but disappointing Pacific Rim. This follows the period-set story of Edith (Mia Wasikowska) whose father is a big shot and attracts the attention of mysterious clay miner (?) Thomas (Tom Hiddelston) out to raise money for an invention but needs Edith’s father’s backing. Yet Edith’s father doesn’t like the look of him or Thomas’s creepy sister, Lucille (Jessica Chastain). Yet intent on swaying the man, Thomas sets out to win the heart of Edith after muscling his way into a ball put on for the local dignitaries. Very Pride and Prejudice so far you may think. However following a turn of events I won’t spoil, Edith is whisked off by Thomas & Lucille, to an ancient creepy old house with more than it’s share of ghouls and ghosts, and so Edith must unravell a mystery surrounding the house and the brother and sister who have come into her life. For a start, this is one of the most breath-taking visual treats I’ve had at the cinema in a long time. Every shot and camera angle and corridor, room and costume is a work of art – it really is a gothic visual masterpiece. How then, you might ask can the movie be so uninvolving and lacking in depth or personality? 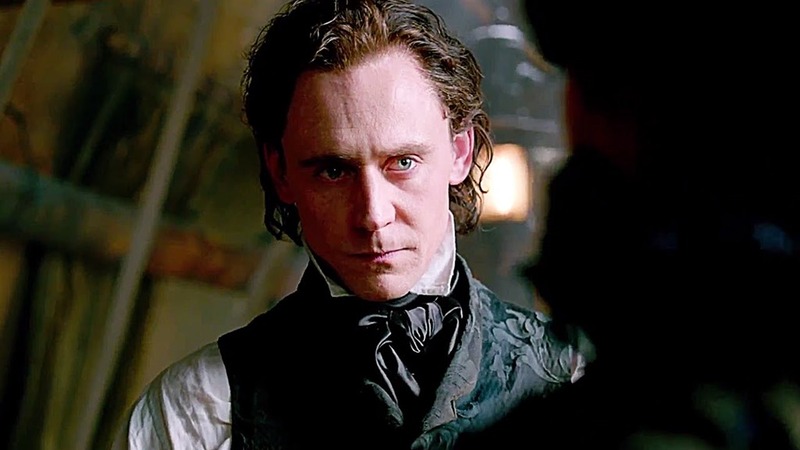 The performances are decent (especially Hiddleston) but with a plodding script, zero chemistry between Thomas and Edith despite their insistence on being in love and scenes I’m sure were meant to be scary or disturbing, much of this just came off as ‘meh’. It goes as far as how the characters react to stuff, like Edith witnessing some grotesque legless creature coming out of the floor and crawling after her down a corridor – only for Edith to look puzzled and run away. Yeah, I see that sort of thing every day! What doesn’t help either is that the ghosts seem overly CGI – Del Toro is known for pioneering some amazing creature designs over the years and has used prosthetic make up to brilliant effect (Pan’s Labyrinth’s awesome Pale Man). These sequences just didn’t have the same impact. Add to this the eventual reveal and point of the whole story coming off as ‘…is that it?’ – and I just came away feeling deflated. From early word I’d read I hadn’t expected a full on horror, but did hope for characters I would care about and a story that pulled me in – but beyond the obvious artistry of the visuals, this did anything but. I have a feeling a second viewing may fair better, but as it stands this was disappointing. 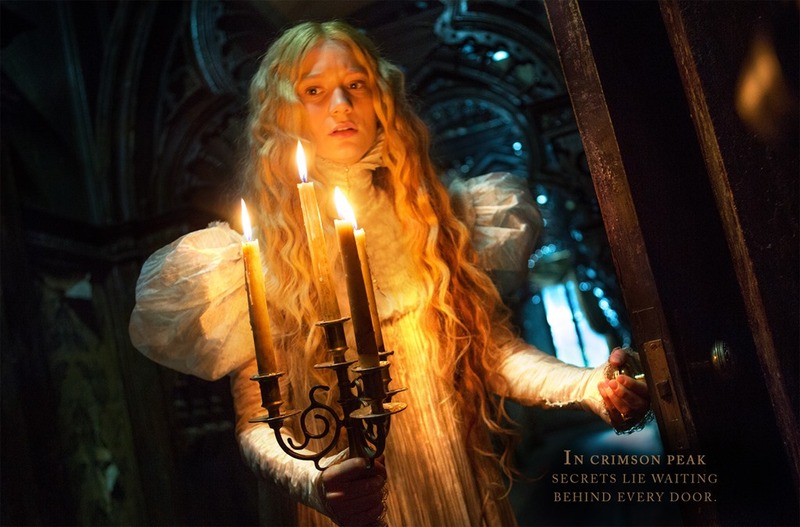 This entry was posted in Cinema, Drama Reviews, Horror Reviews, Movies, Reviews and tagged Crimson Peak, Gothic, Gothic Horror, Guillermo Del Toro, Jessica Chastain, Mia Wasikowska, Tom Hiddleston by Craig M. Bookmark the permalink.